If there is any doubt that the right exposure at the right time can have an amazing impact on your project, here are a few recent examples that really struck me when I noticed them. … and the backers per day blew up to nearly 120 for a single day, more than all the prior days combined. Zpocalypse is a game I’ve followed pretty closely because, as some of you know, I’m a big boardgamer myself and it was on my list of games to possibly pick up this year. I’ll try not to be too jealous, but these jokers got to meet and hang out with Felicia Day at PAX East, and she posted about the game soon after on April 11th on her Facebook page, then again via twitter later that evening. While the daily pledge chart doesn’t show a whole lot, the backers and pledge charts show the real impact of the post. With countless retweets and favorites, along side over 230+ shares, 840+ likes, and over 100 comments, Felicia’s Facebook and twitter posts nearly quadrupled Zpocalypse’s average backers from the 10-day average prior, and carried through boosting their daily backers & pledges way above the average for the campaign. Almost all projects get some kind of boost at the end, but they were lucky enough to enjoy a 12-day boost that pushed them into the stratosphere. 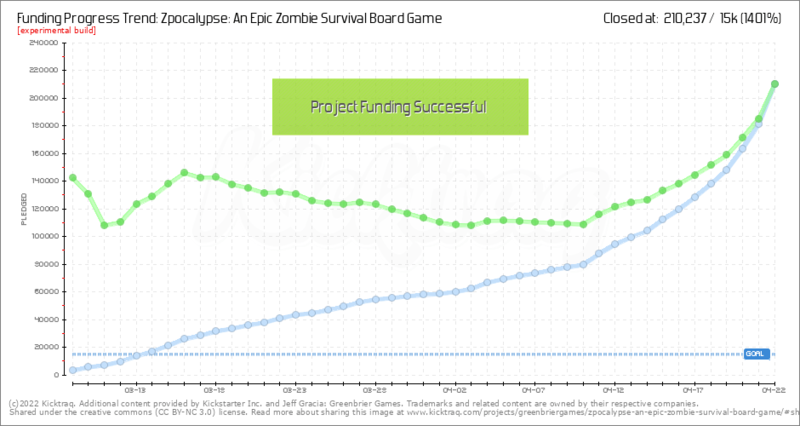 Even though there are two other boardgames scurrying right up behind them (Zombicide & Ogre), that surge at the end of their campaign planted Zpocalypse firmly as the #1 funded project in their category – almost doubling the previous project (D-Day Dice). Well, at least for a few more days. And if we look at the trend convergence chart, notice the normal downward slope takes a sharp turn up on the 11th. Just thought I’d share a couple fun examples as I dig through data at 1am on a Sunday morning finding anomalies for the projection matrix. These are what make building projections a challenge and a total shot in the dark. But, it’s what I do. I like a challenge.